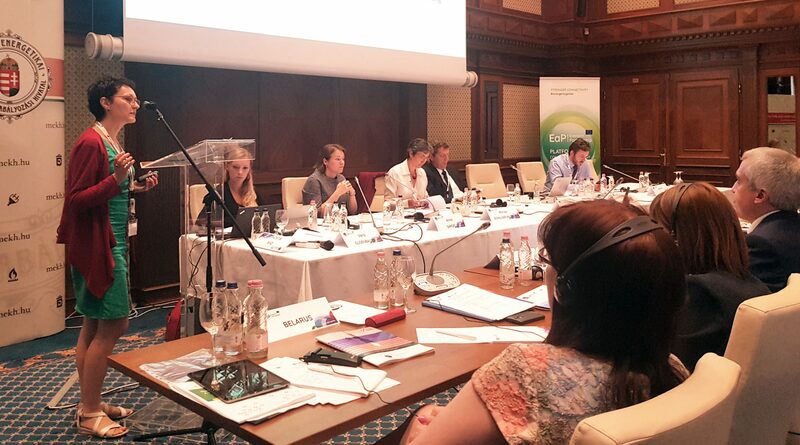 On 14-15 June, Ana Otilia Nutu, member of the Eastern Partnership Civil Society Forum (EaP CSF) Steering Committee, attended the 7th EaP Workshop on Energy Regulatory Bodies, which took place in Budapest (Hungary). During the first day, energy regulators from Austria, Czechia and Hungary, the European Commission, energy companies and energy organisations briefed its Eastern Partnership counterparts. On the second day, participants made a field trip to the a natural gas transmission company: FGSZ. The main topics discussed during the first day included energy security; solidarity in energy matters, which must be a key consideration in discussing the future gas transit through Ukraine post 2020; the importance of harmonised regulations; and the need to intensify cooperation between the EU, the Energy Community contracting parties and the EaP countries on security of supply and market integration. The targets for 2030 in the new directive proposals were also discussed. During the discussion, Ms Nutu asked whether Ukraine’s plan to join ENTSO-E (European Network of Transmission System Operators for Electricity) is still on track and what has been done in the past year, as Ukraine announced a year ago that they could join ENTSO-E fully in 6 years. This affects the choice for Moldova’s interconnection on electricity with Romania – if Ukraine joins ENTSO-E, Moldova should also join and opt for a cheaper interconnecter. The Ukrainian regulator replied that in the past year they have worked on the action plan and that their current assessment is that joining ENTSO-E would cost only 500 million of UAH (17 million of EUR), which was perceived as unrealistic by the EaP CSF representative. Azerbaijan: the new energy regulator is set up consistent with the EU model, with support from EBRD and ADB; new electricity law establishes prerequisites to develop an electricity market. Azerbaijan supports the Southern Gas Corridor, TANAP. Belarus: the current Government policy focuses on diversification of energy supplies and energy efficiency, including the reduction of gas consumption, and substantial gains have been obtained in the past 3-4 years. Stronger bidirectional interconnections with the Baltics, Poland and Ukraine are envisaged for electricity. Georgia: the energy legal framework is under harmonization with EU directives. The Black Sea Balancing Market Integration project is on the way – a study has highlighted the requirements for harmonization of grid codes, regulations on balancing responsible parties, and the methodology to calculate the costs of transmission use. Georgia envisages an increase in the interconnection capacity with Turkey (2x), Armenia (4.7x) and Russia (2x) by 2020. Energy efficiency plans include investments in hydro; modernization of gas-fired plants, optimization of capacity reserves and better management of transmission and distribution networks. Moldova: 74% dependent on energy imports, 3.3x higher energy intensity than the EU Member States, although in the past decades there have been improvements. New laws on energy, electricity and gas were approved in 2016-2017. Electricity and gas interconnections with Romania are envisaged. New legislation for renewables supports producers through fixed price/fixed tariffs and encourages prosumers through a net metering regulation. Ukraine: recent legislation (2015-2017) has transposed key provisions of EU acquis for the SoS for gas. For electricity, legislation has been approved in 2017, new transmission and distribution codes were approved in 2018 and regulation on SoS is in a draft form. The regulator has been recently empowered with key functions on monitoring the market, monitoring the 10-year development plans for electricity and gas, monitoring of SoS. Key challenges are: dependency on imports, loss of control over key primary resources (coal in Donbass); cyber attacks on infrastructure; insufficient interconnections. Ukraine needs to implement secondary legislation for market development, diversification of supply, energy efficiency, integration in ENTSO-E, SoS at regional level.